Hi, Lucy here, for my final Guest Designer project. 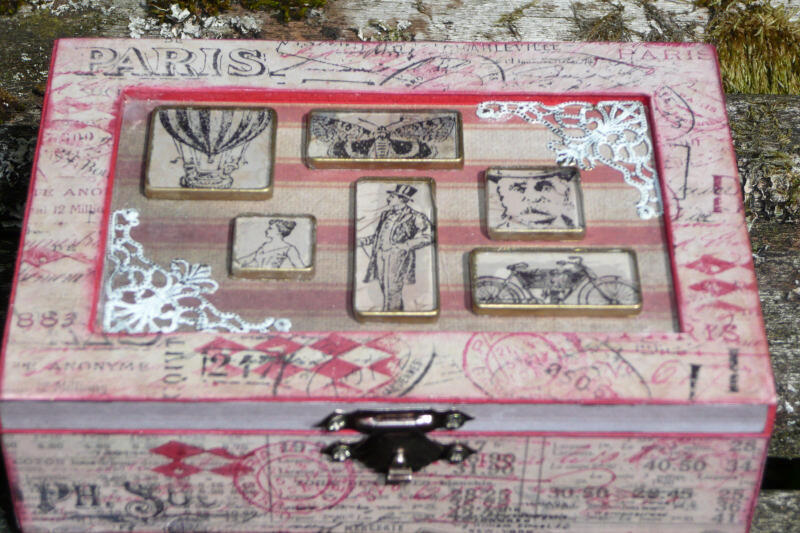 I wanted to make something that would really showcase the gorgeous Tim Holtz Tiny Things stamp set and I thought this trinket box with its recessed or inlaid section on the lid, would be perfect. 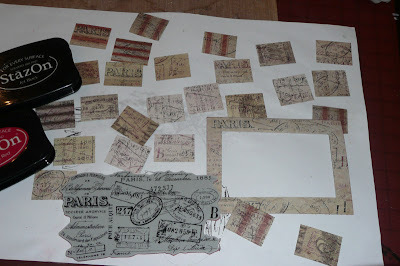 I also wanted to use his French Industrial papers which I used for the Tart Tin last week, but this time using the plainer designs and building up layers of stamping in co-ordinating inks, again with a Paris theme. For the tiles I've used Tim's Fragments acrylic pieces from my stash, but if you don't have any of these, why not use chipboard tiles and glaze them with UTEE? To start off I removed the clasps, sanded the box, painted it red, inside and out, and cut the papers to fit all of the sections. I stamped all the pieces with the large background stamp from the Tim Holtz Memoirs set, and also his Harlequin stamp I've had for years. I used StazOn in Jet Black and Blazing Red but I didn't really like the red as it was too pink so I switched to using the paint I'd used on the box, dabbing it onto the stamp with cut n dry foam. I glued all my pieces in place with Gel Medium. I used an unstamped strip of the paper between the lid and the edge to break up the design a little. I coloured my clasps and hinges with alcohol ink and screwed them back on. 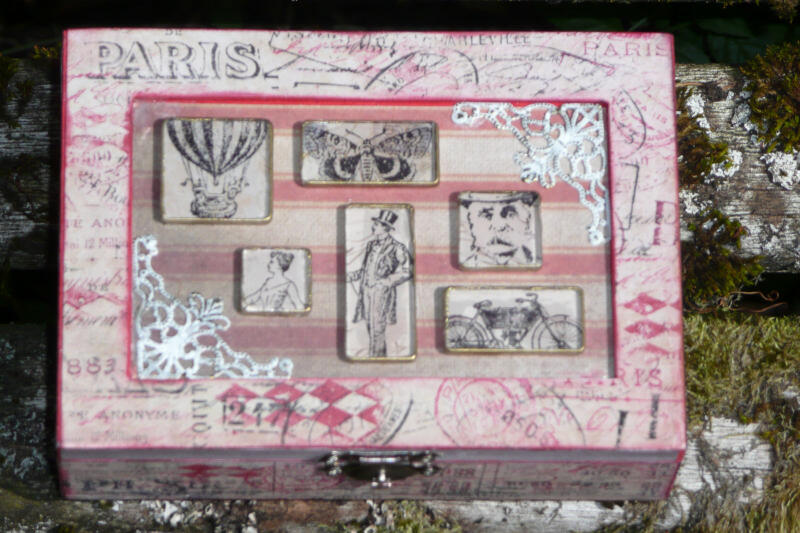 For the tiles on the lid I stamped a selection of the stamps from Tim's Tiny Things set and also the face of the man from the Memoirs set onto some of the plainer paper from the French Industrial papers and glued the Fragments to them with Glossy Accents. I cut round them then edged them with gold pen. I arranged them on the lid and added some metal photo corner charms which I had rubbed with a bit of white paint. I finished off the box with some gold crown charms for feet! Thank you for having me here at Eclectic Paperie: it's been such fun, and your kind comments have meant so much! very pretty assemblage! Love all of the details. The fragement tiles look fab, great box! A really gorgeous altered box, Lucy... wonderful papers and stamping - and the fragments are so cool! A great month of projects. Even the bottom is decorated - and beautiful! Great piece, Lucy. This is beautiful, love all the fragment tiles. Love this box, great work! Oh this is just jaw dropping gorgeous! I love that box top and how clever to fragment tile the images to create such great depth. 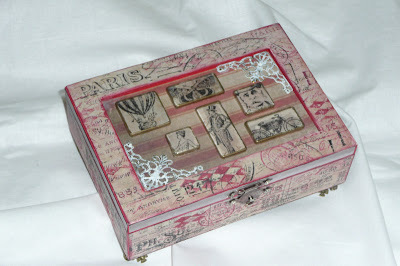 Love this altered box, Lucy! Hugs! 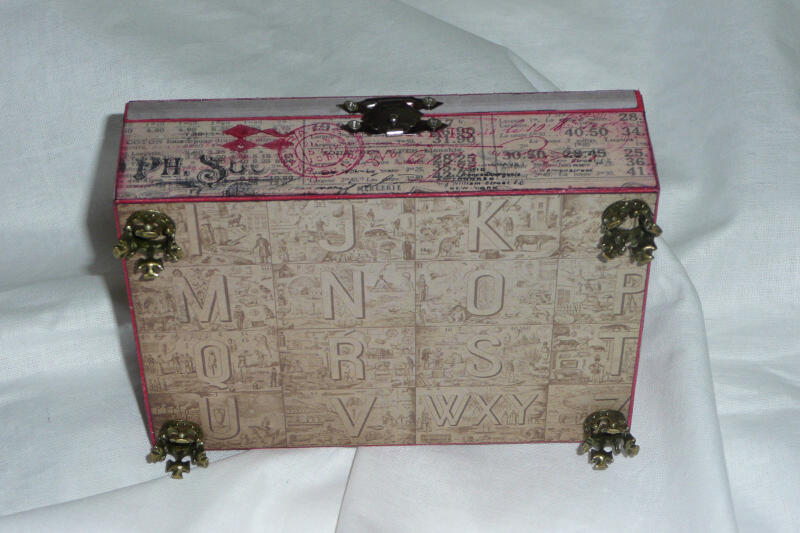 Love your trinket box, Lucy!!! Perfect box to hold lots of goodies! Love the colors. 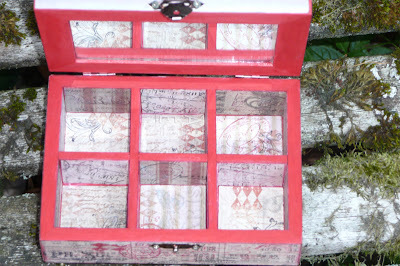 Totallu stunning trinket box Lucy..a beautiful keepsake for years to come! !